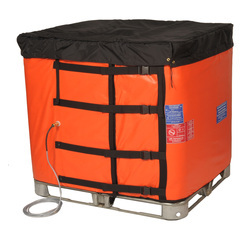 This unique product utilises a patented carbon rich semi-conducting flexible membrane to ensure temperature stability when heating "Schutz" style IBC's (metal cage frame with plastic liner) in potentially explosive atmospheres. It is designed for ease of use as it can be easily fitted onto the IBC by one or two people. Simply attach the hooks onto the top edge of the container, wrap the jacket around the tote, pull the straps and buckles tight when the heating jacket is in place and connect the integral five metre cable to a certified electrical connection. The widest range of tote blankets and IBC heating jackets from one manufacturer, from value for money budget designs for winter warming through to high power versions for heating highly viscous liquids, and certified versions for use in areas where there are potentially explosive vapours. If you do not have a viscosity problem during the summer months with the liquids in your totes and IBC's, it is unlikely you need to pay more for our higher power versions! 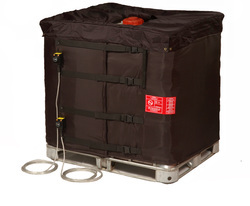 Simply wrap one of our standard "IBC1" jackets around the container, preferably adding our insulated lid to avoid overnight heat loss from the top surface, plug it in to the electricity supply (110v ac or 230v ac, single phase) and you will be able to lift the temperatures sufficiently to readily remove the contents. For materials that are more difficult to remove year-round, or where time to temperature is more critical for other process reasons, then our "IBC2" or "IBC3" varieties will be more appropriate. It is never fast to heat 1000 litres of any liquid! Please email or call if you would like to discuss the typical rates that can be expected under normal circumstances. We also manufacture heavy duty pvc covers that can be placed over the IBC and heating jacket to provide additional protection against rain, snow, dust etc when used in more exposed locations. In some applications there may be no need for heating, so we can also supply insulation only jackets covering the vertical sides and top of the container. These are manufactured using very high density insulation for optimum effectiveness.